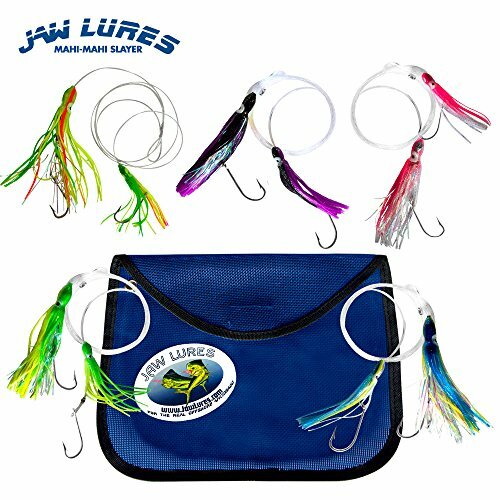 THE ORIGINAL JAW LURES TUNA BUSTER COMBO From beginners to pros, JAW Lures is the right choice for you! 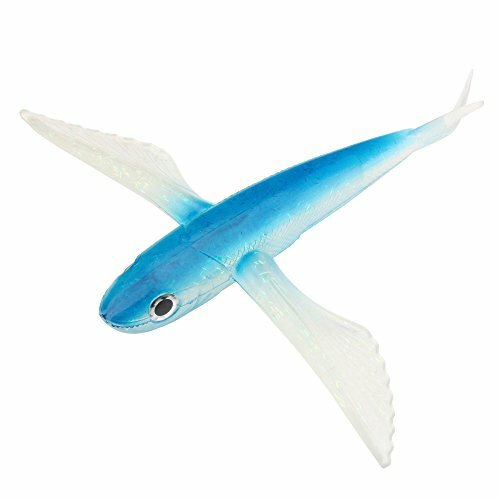 Different from the Rest Our lures provide serious beginner and tournament offshore anglers with the ultimate competitive advantage - the ability to hook TWO big fish simultaneously. Each lure has 2 independent JAW Lures squid skirts and 2 independent mustad 3407 SS-DT stainless steel 3 Inch hooks, located 3 feet apart on the line No Rigging Needed Our lures are out of the bag and done! Each lure is hand rigged with two hooks, 100 lbs AFW HiSeas clear leader material and stainless-steel crimps, and of course our own JAW Lures squid skirts. 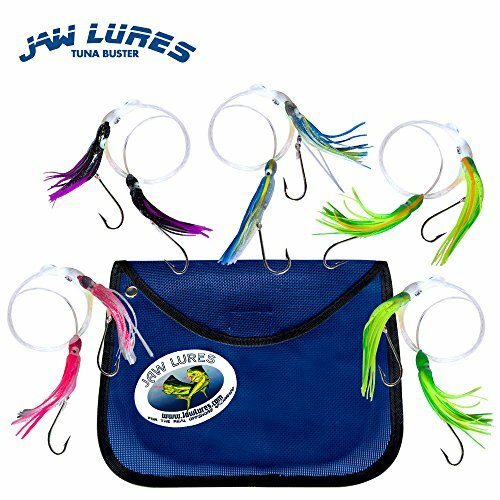 Five Variations in the Combo Our Tuna Buster Combo includes one buster in Pink-Silver, one buster in Black-Purple, one buster in Blue-Silver, one buster in Chartreuse, and one buster in Flo-Green, all in a lightweight mesh 12x12 bag. Proudly Made in the USA By the hands of professional anglers. THE ORIGINAL JAW LURES MAHI MAHI SLAYER COMBO From beginners to pros, JAW Lures is the right choice for you! Different from the Rest Our lures provide serious beginner and tournament offshore anglers with the ultimate competitive advantage - the ability to hook TWO big fish simultaneously. Each lure has 2 independent JAW Lures squid skirts and 2 independent mustad 3407 SS-DT stainless steel 3 Inch hooks, located 3 feet apart on the line No Rigging Needed Our lures are out of the bag and done! Each lure is hand rigged with two hooks, 100 lbs AFW HiSeas clear leader material and stainless-steel crimps, premium UV sparkling duster, and of course our own JAW Lures squid skirts. Five Variations in the Combo Our Mahi-Mahi Slayer Combo includes one slayer in Pink (Silver Belly), one slayer in Black (Purple Belly), one slayer in Blue (Silver Belly), one slayer in Chartreuse, Orange, Yellow, and one slayer in UV Green, all in a lightweight mesh 12x12 bag. Proudly Made in the USA By the hands of professional anglers. If you're looking for a light quick action rod, this is it. The Blackfin Tuna Tournament Edition Spinning Rod is made of carbon composite, rated at 12-15 lb. class, has an aluminum reel seat and is spiral wrapped for extra strength. 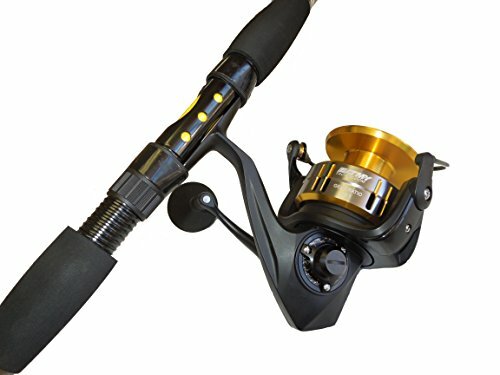 The If you're looking for a light quick action rod, this is it. 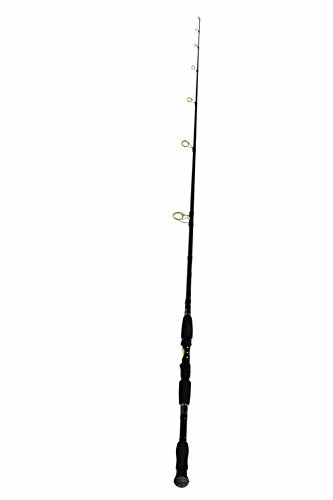 The Blackfin Tuna Tournament Edition Spinning Rod is made of carbon compostite, has an aluminum reel seat and is spiral wrapped for extra strength. The beautiful EVA handle adds a level of comfort when fighting big game fish. The rod features 6 guides plus 1 on the tip. This rod is the perfect fit with our RTA7000 spinning reel. With a responsive tip, yet strong body, you will have no problem catching redfish, grouper, tuna and snapper. 5 year warranty against defects, the longest in the industry. adds a level of comfort when fighting big game fish. The rod features 6 guides plus 1 on the tip. This rod is the perfect fit with our RTA7000 spinning reel. With a responsive tip, yet strong body, you will have no problem catching redfish, grouper, tuna and snapper. 5 year warranty against defects, the longest in the industry. 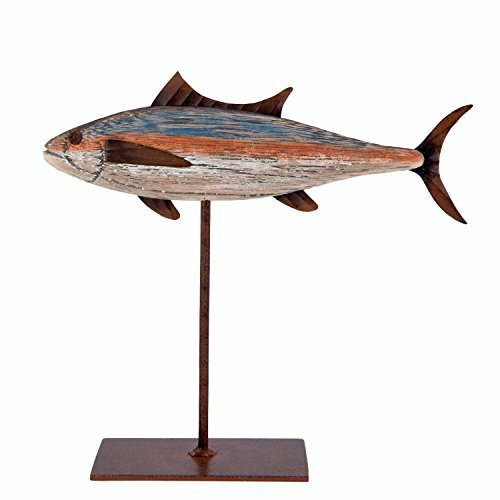 This 35" Blackfin Tuna Half Mount Fish Replicafish replica is the perfect option for livening up your home, office, or even outdoors. These half mount fish mounts are a cost saver and are hand painted to resemble the real species as if it was alive. Our fish replicas are a great choice when and provide the same level of detail as the traditional full mount. Made of fiberglass and 100% artificial, our replicas encourage conservation. Clear coated with the same UV protectant as your automobile, these half mount fish are both durable and resistant to fading, keeping them vibrantly colorful for years to come indoors and out. Equipped with a hanger on the back for easy installation, you'll be able to enjoy your new fish in no time. Please contact us for any further questions! DISCLAIMER: All length measurements have the possibility of being off by a small percentage since we are fabricating in fiberglass using a grinding technique. 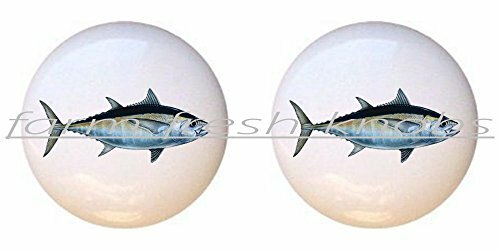 Blackfin Tuna on Stand 9.25"
Trolling Lures for Big Game Fishing This 11" inch Big Game Trolling Lure is A Top Performing Big Game Fish. t is specially designed to bait & hook the target species of: Albacore, Dorado, Wahoo, Swordfish, Bonito, Dolphinfish, Kingfish, Mackerel, Queenfish, Sailfish, Trevally, Yellowtail, Blackfin Tuna, Blue Mackerel, Frigate Tuna, Rainbow Runner, Skipjack Tuna, Longtail Tuna, Bigeye Tuna, Atlantic Bluefin Tuna, Southern Bluefin Tuna, Yellowfin Tuna, Samson Fish, Atlantic Sailfish, Dogtooth Tuna, Indo-Pacific Sailfish, Atlantic White Marlin, Black Marlin, Indo-Pacific Blue Marlin, Pacific Bluefin Tuna, Striped Marlin.- These Hawaiian Big Game Trolling Lure Heads are Indestructible.- Or are you looking for an awesome unique gift for a birthday, secret Santa at the office, or holiday employee gift from the company who likes Deep Sea Fishing? We have just the right trolling lures for you. 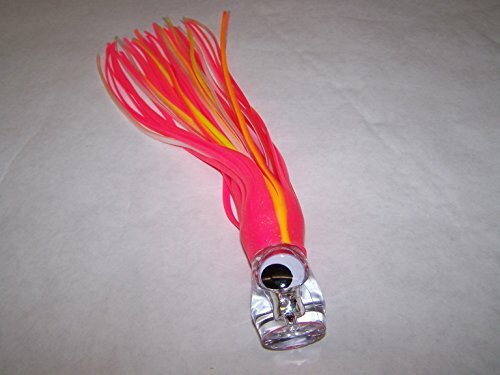 Amazon Buyers Trust Our Trolling Lures to be Quality Premium Products. We Stand By Our Products 100 percent & Offer A 30-Day Money Back Guarantee, NO QUESTIONS ASKED! We Cannot Guarantee this Special Pricing, So Be Sure to Click Buy Now! ALL KNOBS ARE "MADE-TO-ORDER". Therefore, It can take up to five business days to process your order. Once your order has gone to processing, it cannot be cancelled. Standard 1-inch-long screws are included. If you have thicker/thinner furniture, you may need to purchase longer/shorter screws. Knobs are NOT spherical or ball-shaped. Knobs are NOT hand painted. The knobs are white ceramic. The image is applied to the knob using the decoupage method. Great for use on dressers, cabinets, closets, desk drawers, tables and more. Simple to install and great to quickly change for seasons, holidays, parties, etc. To clean, simply wipe with a damp cloth. Do not submerse in water. Not dishwasher safe. All orders are shipped through the United States Postal Service with tracking included. INDOOR USE ONLY. WE ACCEPT CUSTOM ORDERS. Shipping will automatically combine - be sure to place all items in your shopping cart before checking out. 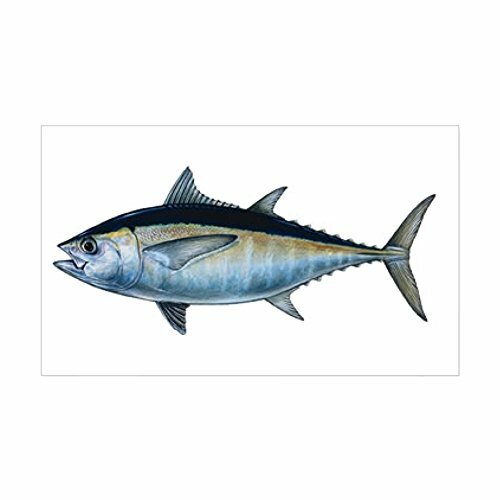 How to clean blackfin Tuna and why they are never on a menu. Here Captain Chris Walters shows us how to clean black fin tuna and prepare sashimi. Blackfin Tuna- Catch and Cook! 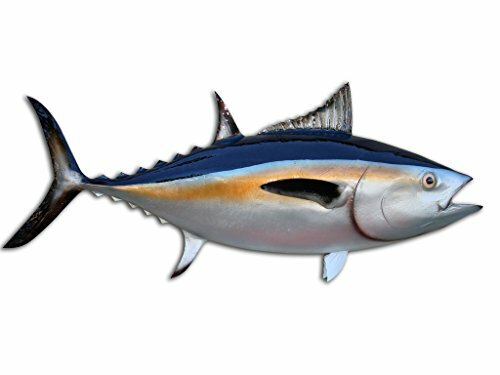 Compare prices on Blackfin Tuna at ShopPlanetUp.com – use promo codes and coupons for best offers and deals. We work hard to get you amazing deals and collect all available offers online and represent it in one place for the customers. Now our visitors can leverage benefits of big brands and heavy discounts available for that day and for famous brands.